Trains, flights, buses, a lot of washing, packing and very little sleep. Not the ideal resting days one would want before a week of climbing in the Alps. Nevertheless I was awake and ready to go to the airport. Probably too tired to show any sign of excitement at 2 a.m. Hours later, after a 50 minutes bus delay and a good run through the airport I was finally in my seat. Only to find out the plane has flight restrictions and would have to wait 1 more hour before departure. Not quite the day I was looking for. Finally in Geneva, waiting for my pack that fails to show up, praying not to be lost. Minutes before my train to Jungfraujoch departs I see it. I rush through the crowds, grab it and start running with 30kg on my back. Just in time. At last I can relax and have my breakfast. To reach the last station the journey takes about 5 hours. One must change several times, but schedule is spot on so nothing to be worried about. After Lausanne, change in Bern – Interlaken Ost ( second station) – Grindelwald or Lauterbrunnen – Klein Scheidegg. I recommend going through Grindewald for a spectacular view of the famous Eiger North face. I’ve joined Cosmin in Interlaken and by the time we got to Jungfrajoch was already after 4 p.m. I must have had a good intuition to gear up in the train because it was a thunderstorm. At the gate a security staff kindly informed us we are on our own. After jumping over the locked protection fence, we bumped into a group of Czech climbers. Opened the door and understood immediately why they were waiting. It was hell on Earth. The only two options were down in the village or up to the hut. Camping inside the station is forbidden. There was no decision to be made as it was clear we won’t be turning back. Extra layers, waterproofs, goggles and GPS at hand and off we went through the storm. Fortunately the lightning seemed to have passed. But when your pack starts flying of the ground, you know it’s windy. 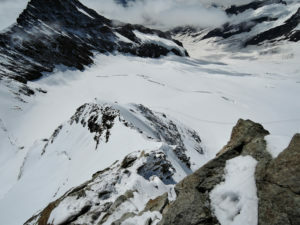 The trail is marked and carved through the glacier so there is no risk of getting lost even in 0 visibility. After about 1h 30m we finally reached the hut and joined the Czech climbers who decided to follow us. We had to wait for dinner to be served before taking our room and heading to bed. The hut is placed at the foot of Monch and while some websites suggest SAC ownership, is private and does not offer discounts for club members. I have read many positive reviews. I however was not impressed. Yes at 3627m is very high, but it also has train and snow vehicle access. Therefore I don’t understand the extreme prices compared to other huts that require helicopter access. The drying room was cold, humid and my jackets never dried properly. Most of the clothes I had them in bed while sleeping in order to properly dry them. The newspaper I’ve carried from the airport was gold and played a vital role in drying my boots, so always have one with you. There is no shower! Toilets are outside and stink. The inside sinks are most of the time locked. There is no drinking water! Rooms are cold but they do have warm blankets, and a few hangers for clothes.You should have a sleeping bag liner with you. Not much space for packs when is full. The hut owner is always grumpy and probably didn’t like us too much as we only bought beer, some soup and a few sausages as we had our own food. Judging by what I’ve seen, they bring a bowl of food in the middle for 8 people, and it did not look appetising. The doors are locked every morning and you need to pay next night to regain access. So somehow your belongings are safe. I woke up tired but anxious to start climbing. Too bad though as it was snowing. Nothing to do, so after breakfast went back to sleep. Few hours later the sky cleared. That was the window we’ve been waiting. The normal route starts minutes from the hut. And that’s where people rope up and put their crampons. It’s 9.00 a.m. and there are already 2 parties ahead of us breaking the trail. 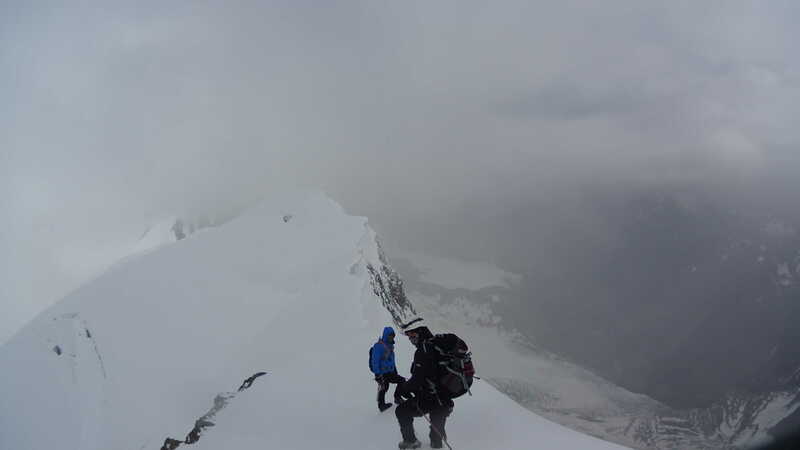 But we don’t even start to climb as one of Cosmin’s crampons comes off. I struggled with no luck to fix it but a hard decision had to be done. Threw the rope in my bag, grabbed the other ice axe and start climbing. There was nothing I could do for him anymore. The route starts directly form the glacier with easy scramble to a rain-gauge at about 3890m. Conditions can vary greatly from season to season. While some photos pictures it as a snow slope, now the rock was dry. From here on there are about 5-6 pitches interrupted by snow patches. Very exposed at places but in general good rock and hand holds. Dual axes are not required and there are a few belay metal poles. Not suitable for abseil as I was hoping. 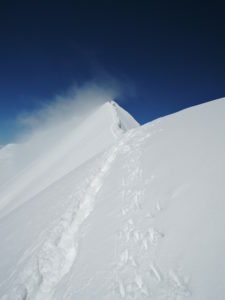 The last step before reaching the famous snow ridge is very exposed and tricky. No room for error there. Especially with the melting snow, rocks are a bit slippery. At first seemed quite hard, but looking back on the ridge I realised it was just the fear of falling. 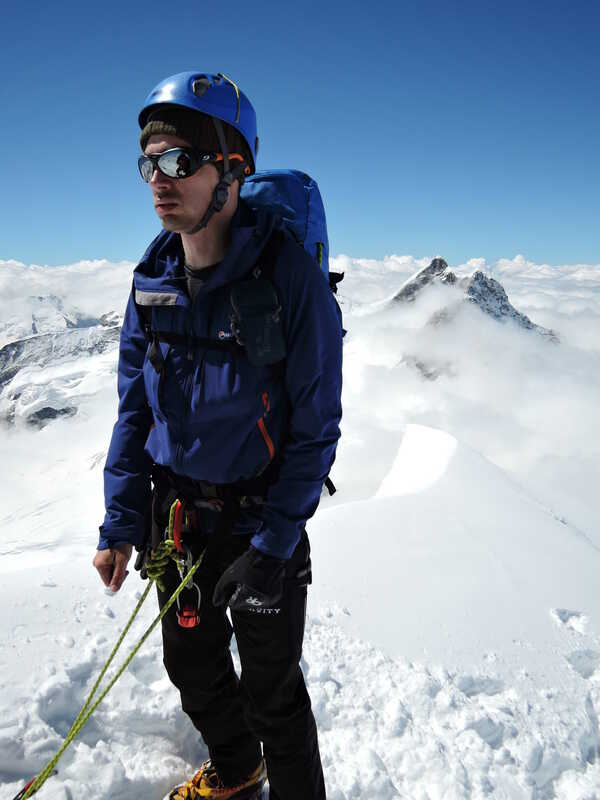 And I immediately remember one of Ueli Steck’s interviews: “when the fear is gone, that’s when you start making mistakes”. But now I was just below the ridge. 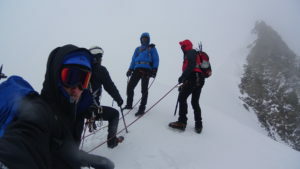 The training in Scotland paid off and my first UIAA II solo was about to come true. While for some this is meaningless, for me this is a great achievement and the proof that I’m becoming better with every year. The last slop was about 40 – 45degrees and snow in good condition, but can be icy in cold weather. The ridge is sharp, exposed and requires care. A slip and no self arrest can stop the fall. Also keep an eye for cornices. I could not resist looking down. It takes you straight to the summit. You know you’re there where there’s no where to go but down. What a view. At 11 p.m. I was on top of Monch – 4107m. Short but great and fun climb. It took me a little to long then it should have. But when time and weather allows, I always stop to shoot some photos and videos. The valley was covered in clouds but the highest peaks still visible. 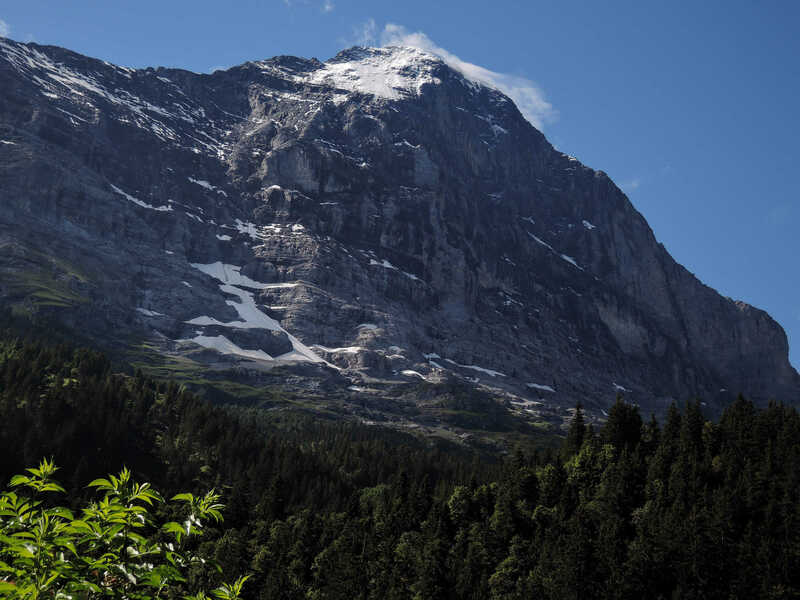 Eiger – Jungfrau – Fiescherhorn and many others. The group of Czech climbers we met the day before also reached the summit a few minutes after me. We took some photos and decided to go down together. Was much warmer now and snow has already started to melt making rocks slippery. The way down was easier and faster. Even though you don’t need it, that rope gives you a safety feeling. I had a 50m rope with me for abseil, a few slings, nuts and hexes. Haven’t used any of them, just dead weight on my back. I suppose I just like to carry stuff to the summit and back. As per the night before forecast, we had high expectations for the day to come. 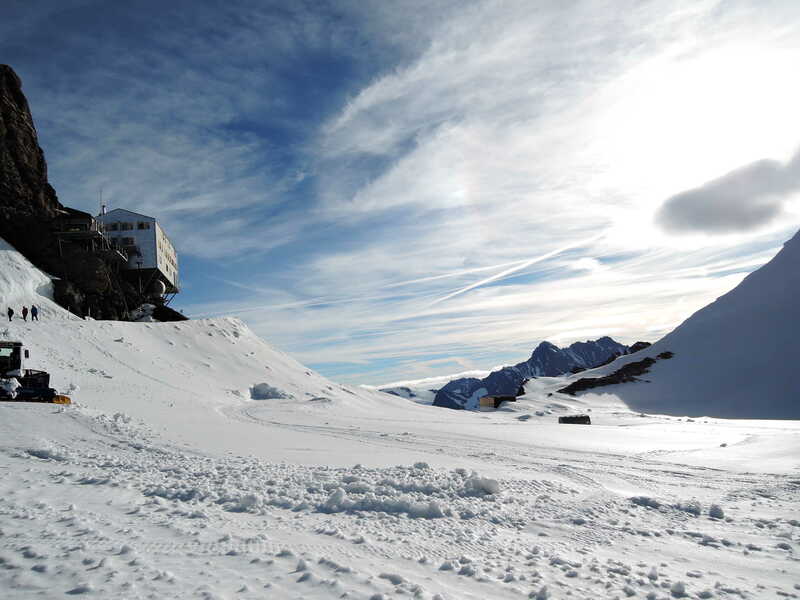 Cosmin decided to stay in the hut due to a tooth infection, but I was determined to reach Jungfrau’s summit. I left at 4am full of hope which soon was about to vanish. Dark grey and threatening clouds appeared far behind the peak. I’ve noticed light in the tents ahead and moved forward. It was Tony, one of the Czech climbers. Their decision was to go for Fiescherhorn instead and I joined them. 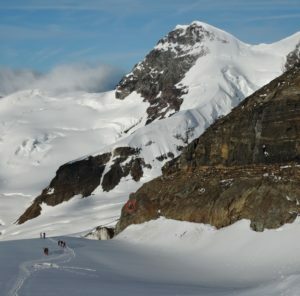 Later in the evening I was going to find out that some of the other climbers summited Jungfrau. I had no regrets though as the weather was horrible. We all left at 5am hoping to stay ahead of the weather. 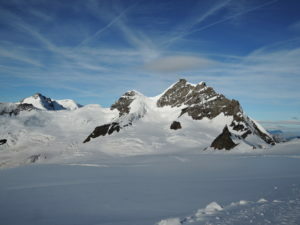 From the Monchsjoch Hut the trail heads East down the Ewigschneefeld glacier. Then across towards South-East, avoiding the seracs on Walcherhorn. The clear path ahead of us which meant there must be a party in front. The summit marks the horizon, but is much further than it looks like. After descending about 350m into the glacial valley we finally starting to gain some height. It’s already windy and soon we see a few climbers coming back. They will be going to the hut due to bad weather. 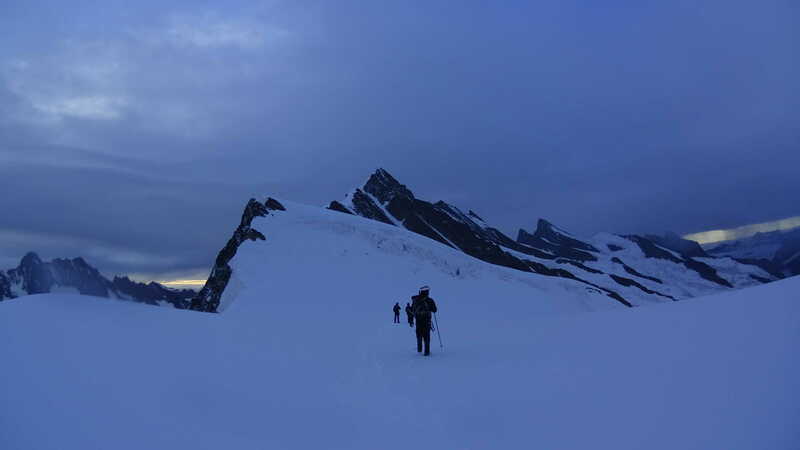 We keep going, and turn left in a zig-zag North West ascent,to find a way over the huge bergschrund. There’s no more trail and visibility quite low. A few breaks for hot tea but we are determined to reach the summit. After a big detour to West, we finally managed to find a bridge over and reached the ridge. The weather seemed to be clearing at times. But only to allow us to catch a glimpse of the valley. 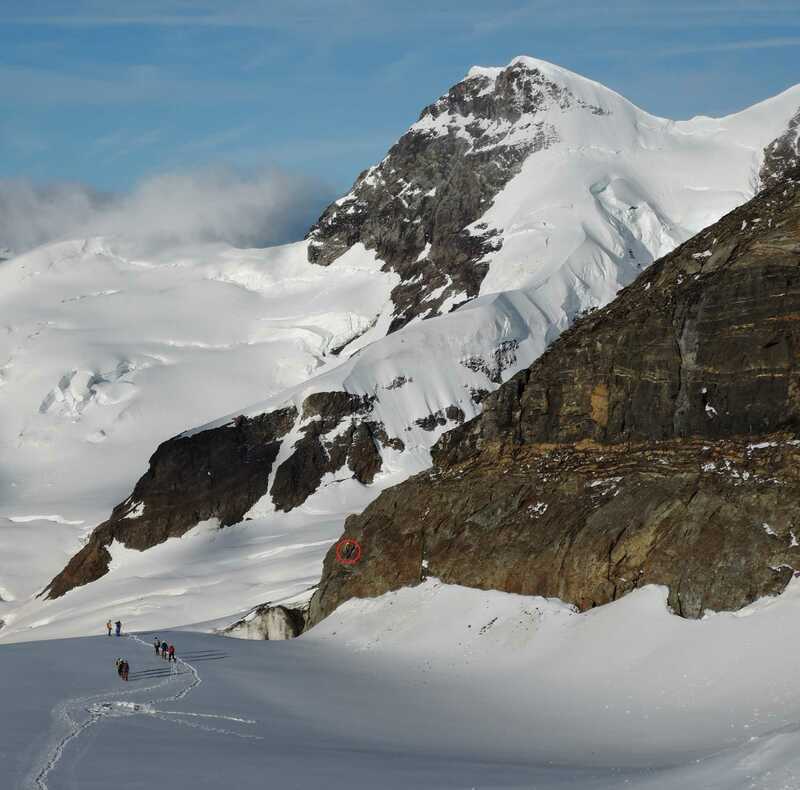 Heavily corniced and steep, it offers views over Kleine Scheidegg and South face of the Eiger. But in high winds and heavy snow is not much to do other than focus to keep balance on the icy slope. We were already 5 hours into the climb and quite hungry. As we approached the last part of the ridge, the weather turned to worse. We stopped just before the summit. I looked at the watch – 3986m. So close but looking at the ridge in front, so far. The North side is a block of ice at about 60 degrees and would make a great easy ice climb on a clear day. The West ridge is a grade III rock and together form 2 pitches of mixed climb. I would have tried but Tony informed me that they decided is too dangerous. I suppose the icy rock would have made the climb very difficult. And we didn’t have any ice gear either. Sad, but better safe then sorry. Was time for us to turn back. On descent we kept West under Walcherhorn and rejoined the initial route down on the glacier. The sky started to clear but the snowing never stopped. A little over 1 p.m. we were washing down the bitterness with a pint of beer. I felt tired and should have probably went to bed. I instead waited for the forecast. High winds and clear weather for the next day, but at 10 p.m. was still snowing. I found myself woken up early morning by the many climber that were heading to Jungfrau. I felt extremely tired and undecided. It was very windy and cold and all I wanted was to go back to sleep. As next day we had to go back to Zermatt and get ready to leave for Monte Rosa in the morning, I’ve decided not to push my limits. I deeply regretted it the morning after. Clear sky and a perfect summit day. Such a missed opportunity. I have failed to complete my second objective. Most probably I would have been exhausted, without food or clean clothes and we would have reached Zermatt almost at midnight. But it wouldn’t have mattered anymore. 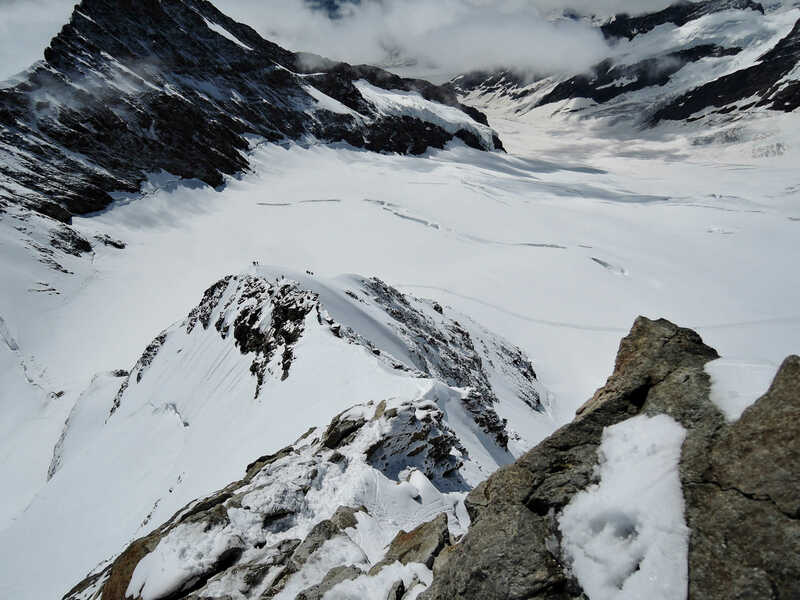 Now the only reason to go back is for Jungfrau. And it does look majestic.